Whether you're expecting, or know someone who is, this photo is the perfect way to welcome a newborn. 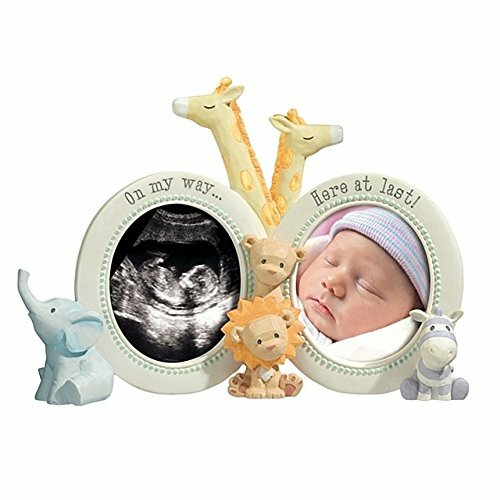 The frame features two different frames, and a variety of cute animals. The back of the frame is felt lined, and features an easy to open design. Each frame can hole one photo that measures 2.75 x 3 inches. One side has "On my way...", and is great for showing a sonogram or a picture of the pregnant mother. The other side reads "Here at last! ", perfect for showing a picture of the newborn. Each fram holds one photo. Frames designed to hold 2.75 x 3 inch photos. If you have any questions about this product by Grasslands Road, contact us by completing and submitting the form below. If you are looking for a specif part number, please include it with your message.